Having thumbnail recent posts and label posts looks far better than the regular text feeds we commonly see with RSS feed aggregation. Thanks to a new reworking on the feed2js by engadgeteer.com's Bryan (who btw is also an anime fan), I was able to finally automate, thumbnailed posts for my blog and their labels. Of course, I'd like to have the code be local to my own site for SEO and security purposes, but this will do for now till I work a deal with them. 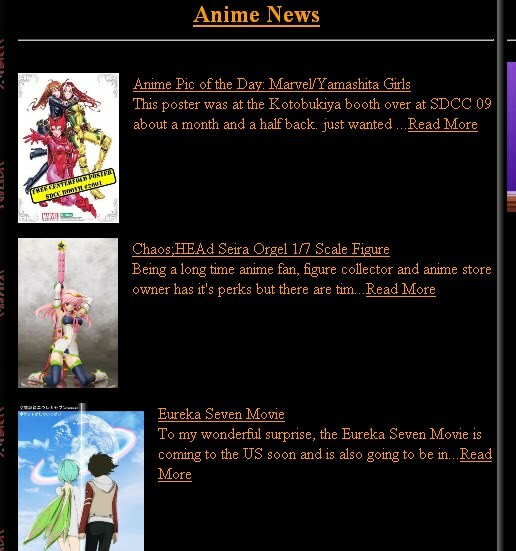 Check out some of the areas I've added recent posts to, like the front page (at the bottom), here (check below), and even on sections like anime figures, cosplay and anime music. Now with this, I can bring back old sections of the site like say Final Fantasy VII Tifa's section and have all posts about Tifa show under her gallery of photos automatically. This will then be integraded with the Member's Blog for more exposure to your posts. Speaking of the member's blog, um, some of you signed up to blog and possibly win Nendoroid Kureha but haven't posted a single post -_- You have to be in it to win it guys, and being in the contest means posting on the Member's Blog . Thanks again engadgeteer.com and their developer, Bryan for this much needed feature.